The 2018 Rugby Captains Dinner promises to be the most spectacular yet. 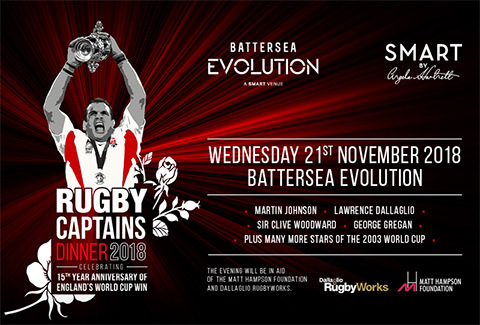 Joining us to celebrate the 15th Anniversary of England’s historic 2003 Rugby World Cup win will be the players and coaches from that victorious squad, as well as other key personalities from the tournament including the opposing Australian captain of that famous final, George Gregan. The menu will be created by the award-winning Smart by Angela Hartnett and guests will be treated to some stunning entertainment. Hosted by Martin Bayfield and supporting two well-loved rugby charities, the 2018 Rugby Captains Dinner is simply an event that cannot be missed.